Cold War Publications, 9780996478618, 432pp. Rick Fontain is back. "Stinger" is a Cold War adventure that peers inside the exploits of Congressman Charlie Wilson and CIA's Task Force Chief Gust Avrakotos. Strange bedfellows they were.... Their alliance proved to be one of the most successful partnerships in the history of the CIA. 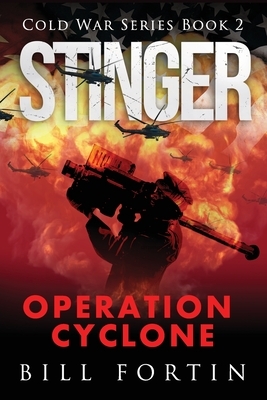 "Stinger: Operation Cyclone" centers on the results of their efforts. The adventure begins with the election of Ronald Reagan in 1979. This was the same year that the Soviet Union invaded Afghanistan. Early in 1982 POTUS called for a plan of action to arm and finance the Afghan Freedom Fighters known as the Mujahideen. Operation Cyclone was the code name assigned to this project. CIA Officer Mike Vickers, not a participant in this story, was solicited by Avrakotos to help design and roll out the blueprint to equip the Mujahideen. Included in this Covert Action program was the Stinger guided missile. This weapon system would be credited as the major factor in the Russian withdrawal in 1989. General Gerald Bushman returns as the Director, Defense Intelligence Agency. Rick Fontain, who is now a Member, Technical Staff, of AT&T's Bell Labs, is brought in for his expertise with the Stinger technology. His familiarity with the Russian gunship, the Mil Mi-24 is just icing on the cake. Rick is re-united with his Redeye instructor, Andy Davis, and together they lay out a plan to kill buku Russian aircraft. However, the operation stalls in 1982 and does not move forward until Rick thwarts an assassination attempt on one Maalouf Torki bin Taisei. Mr. Taisei is a Malaysian government official. He is also the largest arms dealer on the Pacific Rim. The KGB gets wind that the Pakistan ISI has agreed to support Operation Cyclone. Their attacks are fierce. However, the result is not what they expect. President Reagan issues a change to the original operation requirements. The gloves come off. Rick Fontain is told to do whatever it takes to get Stinger into the hands of the Afghan Freedom Fighters. In 1985, Pakistan's President Zia finally OK's the American plan to provide the Stinger technology to the Mujahideen. American Special Forces, the Green Beret and DELTA, are assigned to the training center at the ISI's Ojhri Camp. The CIA's LTC Jim Pezlola and CWO Gary Larson solicit the Mujahideen Command to provide students for the very first class of Stinger shooters. Rick takes the graduating class into Afghanistan to the Russian airbase at Bagram. The rest, as they say, is history. Operation Cyclone may not have ended the Cold War, but it certainly weakened the Soviet Union's resolve. So much so, that in 1993 it financially collapsed.